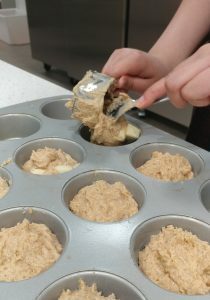 This super easy recipe for applesauce muffins has less than ten ingredients, many of which can be found either in the HSRC Food Pantry, or in your pantry at home! 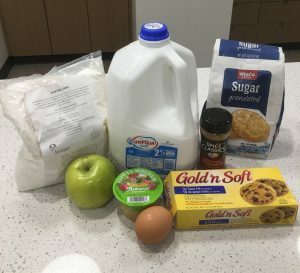 The stars of this recipe are the pre-made baking mix that can be found in our Food Pantry at Avery Lodge, as well as some unsweetened applesauce that we also have an abundance of. 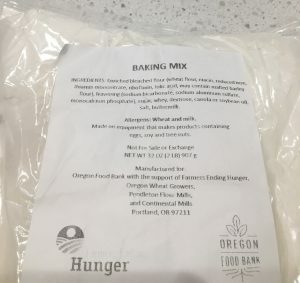 The baking mix, supplied by the Oregon Food Bank, is very versatile and can be used to make pancakes, biscuits, and even muffins like we are doing today! 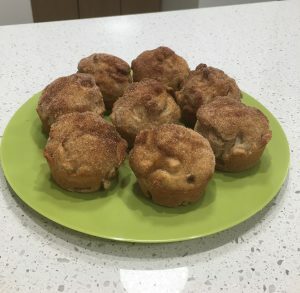 The unsweetened applesauce also adds some natural sweetness and additional moisture to the muffins. 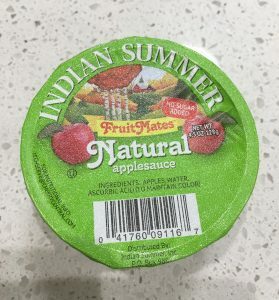 Applesauce can also be used to replace eggs in many recipes. 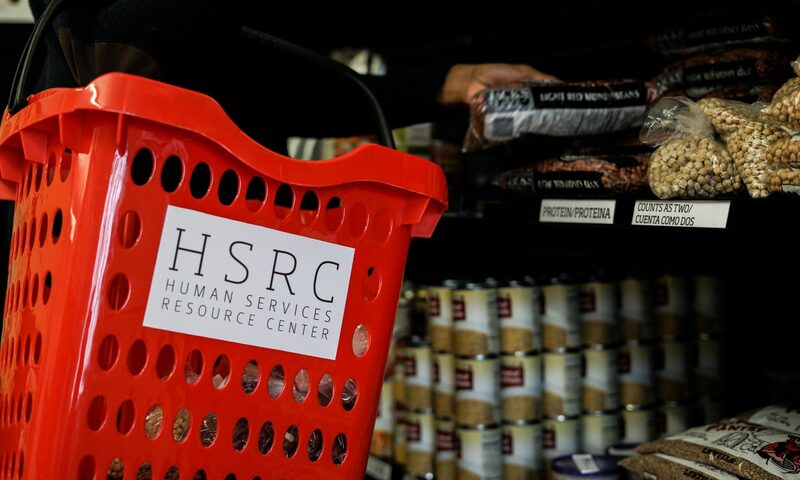 Check out this website for tips! 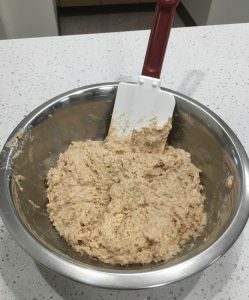 Onto the recipe, which can be either a sweet treat or even an easy on the go breakfast item! 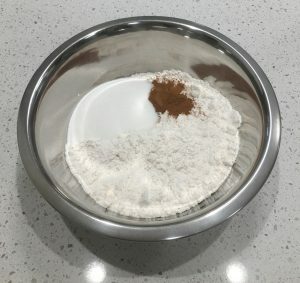 Combine baking mix, sugar, and cinnamon into a bowl. 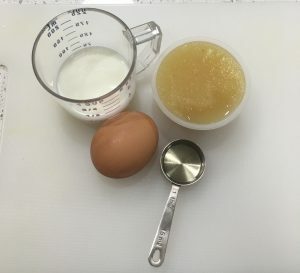 Stir in applesauce, egg, milk, oil. Add other mix-ins if desired. I added about a third of a small chopped granny smith apple to half the batter. 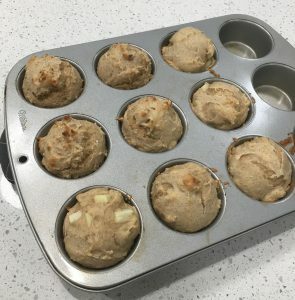 Fill greased muffin tins with batter, about 2/3 full. Using cupcake liners saves some mess and clean up time! 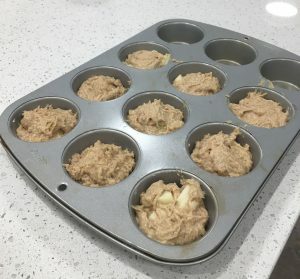 Bake the muffins for about 10-12 minutes. They are done when an inserted toothpick comes out clean. 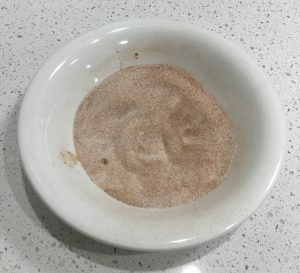 Combine the remaining cinnamon and sugar in a shallow dish or bowl. 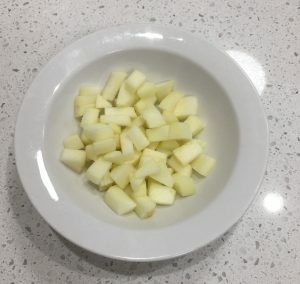 Melt the butter in bowl — be careful with this: remember to cover the bowl with plastic wrap and only heat for about 15 seconds. Gently dip the tops of the muffins into the melted butter and quickly roll into the cinnamon sugar mixture.